After working in the beauty industry for some time, Aneela Zaman came to the conclusion that beauty is not what we cover up, but rather a continuously evolving state of mind. Her personal experience and use of quality skin products throughout her life helped form the philosophy of her namesake line: beautiful skin is the foundation for a beautiful look. When developing products for Zaman Skincare, all avenues led back to her heritage, and the findings of her father. His research discovered various vitamins and minerals that were known to have internal benefits, were equally as beneficial when applied topically. The brand’s first product, SLEEPING BEAUTY SERUM uses the nutrient-dense ingredient, black cumin seed. Although not a fixture in today’s skincare market, this superstar ingredient is now beginning to receive coverage, and is attributed to giving the Zaman family their radiant, healthy glow. “My Father refers to it as a gift from god,” says Aneela. The cold pressed oil provides skin with vitamins A, B1 and B2, vitamin C, niacin, folic acid, essential fatty acids, and various minerals. Many of Sleeping Beauty’s ingredients are naturally antimicrobial, helping reduce inflammation and heal the skin. “We have seen a lot of success using this serum after microblading procedures, actually. The healing time is drastically reduced!” A product made suitable for all skin-types, it’s no wonder why this serum is the brands hero product! Zaman Skincare’s second product, RISE & SHINE SERUM, was inspired by Aneela’s busy schedule and the growing need to multitask. While certain skincare regimens require multiple steps, each needing time to absorb and dry, she found it nearly impossible to complete on a busy morning while rushing out the door. With a condensed and effective approach, Rise & Shine uses hydrating and antioxidant rich ingredients like apple stem cells, hyaluronic acid, jojoba, and green tea to cover both the serum and moisturizer step in your AM routine. With a focus on highly effective actives and a simple skincare routine, the brands two products form a uniquely balanced system. Rise & Shine is an intensely hydrating water based product, while Sleeping Beauty is a nourishing oil based product. Each can stand on its own, but like any good relationship, they’re better together! This dynamic duo creates a balanced skincare regimen to nourish and defend the skin’s barrier. When asked about the future, Aneela finds more value in tools and application methods rather than bucking the latest beauty product trend. “Stone facial rollers are amazing. They increase product absorption and skin circulation, which is where we get lively, full complexions.” In addition to the brand offering Onyx and Obsidian facial rollers, she also hopes to increase the brands product offerings by including everyday essentials. 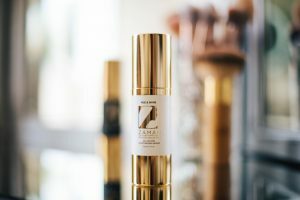 “A great cleanser, toner, and moisturizer are items every woman needs.” Zaman Skincare has a bright future ahead and consumers can count on effective products and simple beauty routines from this brand to bring a little balance.